This is the latest in a series of blogs that explore the state of American Evangelicalism after the 2016 election. The first blog reflected on questions related to why Evangelicals so strongly supported the candidacy of Donald Trump. An unplanned second post explored the historical relationship between Evangelical Christianity and White Supremacy. This post asks why Bernie Sanders never really caught on with Evangelicals. In September 2015, in the midst of a heated primary battle with Hillary Clinton, Bernie Sanders did the unimaginable: he became the first democratic presidential candidate ever to speak at Liberty University, Jerry Falwell's conservative citadel in Lynchburg, Virginia. Some speculated that he was after a growing market-share of young evangelical voters: those who are committed to social justice. By his own account, Sanders explained that he went to Lynchburg in spite of the fact that his positions on abortion and gay rights would place him at odds with a large majority of the student body because he thought that it was important to foster civil discourse regarding political difference. It's not Sanders' appeal to civility I want to point out but the content of his speech itself [written version here]. Sanders' speech deftly appeals to scripture to suggest that disagreements about abortion and gay rights should not overshadow real similarities that Evangelicals should have with Sanders' platform. Particularly, Sanders quotes from the gospels and the prophets to make his point. The scripture passages that frame Sanders speech are Matthew 7:12 and Amos 5:24. Matt 7:12 (NIV): So in everything, do to others what you would have them do to you, for this sums up the Law and the Prophets. Amos 5: 24 (NIV): But let justice roll on like a river, righteousness like a never-failing stream! Income inequality is not merely that the wealthy are wealthy; or, that they grow their wealth. Its that they continue to grow their wealth while a large number of hardworking Americans labor for less than a living wage and no benefits, often working for corporations that pay dividends to their wealthy investors instead of improving working conditions for their employees. Particularly, Sanders is concerned about the children who live in families that exist under the poverty level (20 % of all children in America, according to Sanders). Sanders' appeal should find a sympathetic hearing among evangelicals. For one thing, the logic of his attack on income inequality–in this speech, at least–takes on not a call for controversial government aid (so-called "handouts") but a call for a fair playing field. To a people that traditionally pride themselves on the idea that anyone that gets a job and works hard can make it in America, he is simply asking them to insure that the field remains level enough for this to be true. In the case of his Liberty speech, Sanders asks the crowd to consider what justice looks like within the context of their own ideological commitments. So, you are committed to small government and a strong personal work ethic. Fine. Let me ask you, is it just that someone with a strong personal work ethic and a desire to be self-sufficient can work a full work week and not even make enough money to support a family of three much less rise above the poverty level? From there, he expands the question of justice to consider whether or not access to basic medical care is a question of justice, and then, to the question of maternity leave. Particularly, with the example of maternity leave, Sanders repeats his rhetorical move to appeal to conservatives within their own ideological framework. He asks, in effect, how can you be a people who cares about family values and yet expect for mothers to abandon their newborns during a crucial bonding time in order to return to work? Sanders ended his speech by quoting Pope Francis regarding the dangers of idolizing wealth accumulation. Then he appealed to Liberty students to consider the relationship between justice, morality, poverty, and the accumulation of wealth. Bernie's speech was not, in and of itself, particularly impressive. It was a reformulation of his stump speech. What was more impressive was that Bernie was at Liberty in the first place. The move to re-frame the discussion within an idiom that would meet its audience on its own terms was deft, but ineffective in the long run. And it is that ineffectiveness that is the subject of this reflection. Bernie Sanders' attempt to meet American evangelicals on their own terms–appealing to Israel's prophetic tradition, Jesus' moral teachings, the importance of family and hard work, and the teachings of Pope Francis–was misguided from the start. Even as he attempted to build common ground, he reinforced evangelical skepticism to his argument by striking a familiar Protestant liberal tone. He appealed to themes and authorities that rile up the deepest of fears in the hearts of American evangelicals, and enabled many evangelical voters to confirm the suspicions that they already held: Bernie Sanders is a communist. In my mind, Sanders did this in two particular ways. Sanders' appeal to Pope Francis simultaneously played into long-standing evangelical suspicions of Catholicism and long-standing American suspicions about the papacy. Roman Catholic candidates for national office have always had to prove they are more "American" than "Catholic" in order to allay fears that the Pope would pull the strings of US Government. Al Smith, the 1928 Democratic candidate for President, discovered firsthand the extent of America's suspicion of Catholicism; he lost to a Quaker. For, perhaps, the only time in history, Americans were more afraid of a Catholic than they were of a pacifist! In 1960, when JFK ran for president, similar fears and rumors forced Kennedy to publicly separate himself from the Catholic Church. In a famous speech to a group of Protestant ministers in Texas, he said, "I am not the Catholic candidate for President. I am the Democratic Party's candidate for President who also happens to be a Catholic. I do not speak for my Church on public matters – and the Church does not speak for me." Even so, it was America's growing Catholic population that put him over the top, not his cajoling of Protestant and evangelical fear. Sanders intended to invoke Pope Francis as a voice of reason that would garner sympathy with his Liberty University audience. But doing so reinforced the assumption that Sanders' campaign platform was something that was "un-Evangelical" and "un-American." That Evangelicals and conservative Catholics increasingly find common political ground is a truism at this point. No doubt the shared sense of being attacked by Obamacare's contraceptive mandates galvanized that alliance; but Pope Francis somehow elicits a mix of Evangelical suspicion of central ecclesial authorities with American suspicion of foreign institutional authority that has expanded that common ground. Pope Francis is a divisive figure in American Catholicism, with a large number of white Catholics publicly questioning his teachings and expressing fears that he is a liberal. By quoting him, Sanders played right into Evangelical suspicion of Catholicism, conservative suspicion of European liberalism, and American Catholic suspicion of a "progressive" papacy. Even so, Pope Francis is not the main problem here. Sanders' quote of Francis probably operates more as confirmation for a skepticism that is more deeply rooted in assumption that things like universal health coverage, food and housing subsidies, and government-mandated wages are all steps on the road to communism. It is my contention that Bernie Sanders never caught on with Evangelicals because they were predisposed to reject his use of scripture–a predisposition that is born of longstanding suspicion of the Social Gospel. Sanders' use of the prophets, his appeal to Jesus' so-called golden rule teaching, and his rhetoric regarding wealth disparity channeled the ghosts of Walter Rauschenbusch and the Social Gospel movement, giving Evangelicals the ability to label him with a label that would immediately evoke the suspicion of Evangelicals everywhere: socialist. In the rest of this blog post, I will explore the rhetorical similarities between Sanders and Rauschenbusch. Walter Rauschenbusch (b. 1861) was the son of a German Baptist professor at the American Baptist Seminary in Rochester, New York. His father, August Rauschenbusch, was a 6th generation German Lutheran pastor in the pietistic/revivalist tradition. August moved to America in the 1840s as a missionary to the German settlements in Missouri. He eventually became Baptist and then took a job teaching German at the seminary in Rochester. Walter's childhood was spent traveling back and forth between America and Germany. After completing high school in Rochester, he went to university in Germany, and returned to Rochester to enroll in the seminary. The American Baptist Seminary in Rochester was fairly conservative at the time; Augustus Strong was the president, and according to some accounts, only one biblical scholar on the faculty was prepared to challenge the inerrancy of scripture. Rauschenbusch demonstrated an affinity towards Protestant liberalism when he wrote a paper challenging Strong's account of substitutionary atonement, appealing instead to Horace Bushnell's use of moral influence theory. In 1886, fresh out of seminary, Rauschenbusch took a position as Pastor of 2nd German Baptist Church in Manhattan. 2nd German was a working-class immigrant congregation filled with factory workers. Rauschenbusch quickly discovered that his pietism, with its soul-saving emphasis, was unable to speak to the harsh working conditions, poverty, malnutrition, and child-mortality rates that were commonplace among his congregants. His pietist background told him that politics and economics were distractions from preaching the gospel but his experience at 2nd German Baptist told him that the gospel must be able to say something to politics and economics because it must be able to speak to the suffering that resulted from the economic and political realities of his congregants. Christianity ... is the monotheistic, completely spiritual, and ethical religion, which based on the life of its Author as redeemer and as Founder of the Kingdom of God, consists in the freedom of the children of God, involves the impulse to conduct from the motive of love, which aims at the moral organization of mankind, and grounds blessedness on the relationship of sonship to God, as well as on the Kingdom of God (Ritschl, The Christian Doctrine of Justification and Reconciliation, p. 13). Thus, for Ritschl–and for Harnack and Raushenbusch after him–Christianity is primarily ethical in nature. It posits humanity as the children of a loving Father God who are called to live together in brotherly love as it seeks enact the Kingdom of God on earth; "the Fatherhood of God and the brotherhood of man." In this sense, the Kingdom of God is a social program based on the equality of all humans as children of God. For Rauschenbusch, this vision of the Kingdom of God became the cornerstone of his theological ethics and America became the place where that Kingdom ought to be realized. After his sabbatical, Rauschenbusch returned to his pulpit with fresh eyes. From there he was called back to Rochester to teach German and Church History at the seminary. Finally, in 1907 he published the culmination of his thinking on the Kingdom of God in 1907 in Christianity and the Social Crisis. This work became the classical text in a growing movement within Mainstream Protestantism that was called "the Social Gospel." The Social Gospel was rooted in Rauschenbusch's sabbatical questions: How does the gospel speak to the social reality of inner-city migrant workers? Thus, in order to understand the Social Gospel, you have to understand first what Rauschenbusch called "the Social Crisis." The social crisis was born in the Industrial Revolution. The mechanization of the labor force put a lot of laborers out of work and reduced the cost of labor, requiring families to send women and children to work in order to survive. At the same time, the centralization factories in urban centers forced large migrations of workers from rural to urban environments, effectively creating slums and tenement buildings that were overcrowded. In turn, overcrowding created the conditions that enabled the rapid spread of disease, especially Tuberculosis. All of these problems–overworked laborers, child labor, poor working conditions, unsanitary living conditions–originated in poverty. And poverty itself, Rauschenbusch surmised, was the result of a rapidly growing wealth inequality. The Industrial Revolution not only changed the value of labor, but it changed the very means by which goods were produced, bought, and sold. Previously, laborers sold the fruits of their labor; now, laborers sold their labor itself. The raw materials, the tools, and the means of production all belonged to a relative few. The more laborers there were, the less the labor itself was valued. In the face of this social crisis, the church appeared largely unresponsive. Rauschenbusch surmised that the church's paralysis resulted from a combination of things: the privatization of religious experience, an otherworldly concept of salvation, a tendency to focus on questions of doctrine more than practice, and institutional complacency with the status quo, The church's failure to respond the daily experiences and needs of urban parishioners ultimately pressed Rauschenbusch to the questions that drove him to sabbatical, "what does Christianity have to say to these people?" "Does the gospel say anything to the social crisis caused by industrialization?" Rauschenbusch proceeded to lay out what became known as "the Social Gospel": an explication of the church's mission in the world that draws its main sense of vocation from Israel's prophetic tradition and Jesus' earthly ministry. The Hebrew prophets, according to Rauschenbusch, are the embodiment of Israel's pursuit of righteousness. They spoke publicly about injustice and oppression, and exercised solidarity and preference for the poor and the disenfranchised. They were almost always pessimistic to the status quo and pushed the institutions of the temple and the kingdom forward, progressively aiming towards a kingdom of righteousness. Their willingness to challenge the status quo often placed them at odds with the power-brokers, earning labels like "unpatriotic", "treasonous", and "blasphemous." Jesus takes up the mantle of Israel's prophetic tradition, becoming the greatest prophet of all. Jesus proclaimed a gospel that reinterpreted the law as a law of love. He preferred people over doctrine, and went to those on the margins of society, bringing them within the scope of God's saving agency. His teachings were predominately focused on the Kingdom of God, a kingdom that was being progressively realized like the growth of a mustard seed. He challenged the social idols that prevented God's people from participating in the coming of the kingdom; perhaps none more so than the idol of mammon. The early church continued Jesus' ministry by remaining socially active–caring for widows and orphans, collecting money for struggling churches, sharing resources, eventually starting hospitals, schools, and the like. They expected real and material progress toward the kingdom, even if only incremental. Only after a period of time did Christians slowly begin to shift their eschatological orientation away from the coming kingdom and toward an otherworldly, individual concept of eternal life. Above all else, the Social Gospel was a renewed call for an eschatologically serious Christian Social ethic. For Rauschenbusch, Jesus was the perfection of humanity; he was the one human who embodied the kingdom and taught us how to live into it. Ultimately, what the kingdom of God was for Rauschenbusch was an earthly kingdom where humans lived in harmony and equality with each other under the reign of God. As such, democracy was one of the hallmarks of the coming kingdom that made America progressively closer to what God's kingdom looked like. Captivated by this eschatological vision, the church's mission is to return to the tradition of Israel's prophets, speaking to injustice and oppression, calling society away from the social sins that sicken it and calling society towards the kingdom of God. The gospel ought to speak to the value of life over property, the need to share resources with those in need, the erasure of class distinction in God's kingdom, and in all these things, a preference for the poor and the working-class. In the early 1950s I read Walter Rauschenbusch's Christianity and the Social Crisis, a book that left an indelible imprint on my thinking. ... Rauschenbusch gave to American Protestantism a sense of social responsibility that it should never lose. The gospel at its best deals with the whole man, not only his soul but also his body, not only his spiritual well-being but also his material well-being. A religion that professes a concern for the souls of men and is not equally concerned about the slums that damn them, the economic conditions that strangle them, and the social conditions that cripple them is a spiritually moribund religion" (Strength to Love, 158-159). It is widely accepted that the optimism of the Social Gospel's view of human nature and progress ran into the brick wall of two world wars and genocide, leading most progressive Christians to trade up to Reinhold Neibuhr's Christian realism–a position that promised to take the reality and persistence of human sinfulness more seriously. Even so, the spirit of Rauschenbusch lives on wherever Christians ask themselves serious questions with regards to their participation and commitment in social activism. When candidate Barack Obama pursued the presidency in 2008, he made a point of intentionally targeting people of faith, believing that the Democratic party had shot itself in the foot by overly distancing itself from mainline Christianity on some issues. Obama, who had a history in church-based community organizing, knew that there was strong grassroots potential if he could mobilize communities of faith. 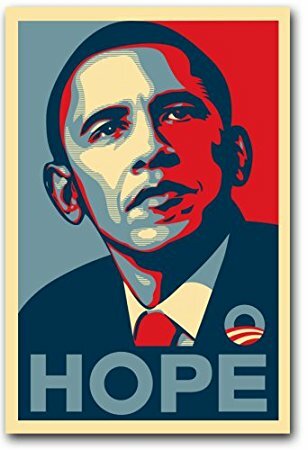 The now iconic "Hope" poster highlighted Obama's appeal to a generation of Americans that were ready to believe in a different future, and were willing to become a part of a movement for change. As it turns out, Obama's theological affinities lay more with Niebuhr than with Rauschenbush, leading a number of progressives to become disaffected with Obama's foreign policy. He signaled as much very early in his presidency, when he received the Nobel Peace Prize. Meanwhile, after he appealed to people of faith in the primaries and the general election, he moved back toward his base during his administration with healthcare mandates that pushed Catholics and Evangelicals further to the right. Indeed, the post-Obama Democratic National Committee even entertained the possibility of refusing funding to any pro-life Democratic candidate in the 2018 midterm election. Against the backdrop of Obama's successful candidacy and appeal to people of faith, Sanders' speech at Liberty University reads as an attempt to follow the Obama playbook–appeal to the moral responsibilities of Christians during the primaries and then move back toward your base. For Sanders, however, the rhetorical appeal to Christians had to come from Rauschenbusch, not Niebuhr. Whether Sanders knew it or not, he channeled Rauschenbusch's Social Gospel when he appealed to the prophetic tradition and the life of Jesus as the basis for a moral appeal to social reform. If he knew it, he made his appeal deftly, aware that the social concerns that faced Rauschenbusch at the beginning of the 20th century were not entirely different from those that confront 21st century America. I think we learn the extent of the similarity by comparing quotes from the two on the problem of income inequality. [in 1890] one percent of families in our country held more than half of the aggregate wealth of the country, more than the rest of the nation put together. ... Seven-eighths of the families held only one-eighth of the national wealth. ... If we want to approximate political equality, we must have approximate economic equality (Christianity and the Social Crisis, 213-214). Rauschenbusch, firmly believing that the Christian vision of the kingdom of God required a deep and abiding commitment to democracy, worried that income inequality made it impossible for social equality. He worried that money in politics would always skew the law to favor the wealthy. For him, the solution was a social vision that asked Christians to consider a methodological redistribution of wealth into public works that would benefit society as a whole. There is something profoundly wrong when the top one-tenth of one percent owns almost as much wealth as the bottom 90 percent ("Income and Wealth Inequality"). We are talking about a rapid movement in this country toward a political system in which a handful of very wealthy people and special interests will determine who gets elected or who does not get elected ("Getting Big Money Out of Politics and Restoring Democracy"). The echoes are unmistakable; the diagnosed problem and the proposed solution nearly identical. That Sanders articulated his vision largely without reference to Rauschenbusch or the Social Gospel on the stump is unsurprising. He did not need the gospel to make his argument to his base; but his appeal to the Liberty student body demonstrates how close he is to that particular vision of Christian political action. If he is familiar with Rauschenbusch, it is perhaps on account of his participation in the Civil Rights movement of the 1960s. If he's not, then he probably came to similar conclusions by appealing to his own Jewish tradition, a tradition that he still embodies even though he claims to be an atheist. The parallels between Rauschenbusch and Sanders all but assured that evangelicals would treat Sanders use of scripture with skepticism. For evangelicals, the social gospel confused the kingdom of God with the fallen kingdoms of this world, suggested that humans could act toward their own salvation, and emphasized Jesus' earthly teachings at the expense of downplaying the atonement. Appeals to Jesus' prophetic ministry that neglected his priestly office were viewed with skepticism because evangelicals (rightly) saw that Rauschenbusch's Jesus didn't have to be divine and his death didn't have to atone for anything; it merely had to be exemplary. It gives a touch of cheerful enjoyment to exegetical studies to watch the athletic exercises of interpreters when they confront these sayings of Jesus about wealth. They find it almost as hard to get around the needle's eye as the camel would find it to get through. ... There is a manifest solicitude to help the rich man through. ... Yet the parable seems simple if one is not afraid of breaking crockery by handling it as Jesus did (Christianity and the Social Crisis, 63). Evangelicals tend toward literal and plain sense readings of scripture; and yet, when it comes Jesus' teachings on wealth, they tend toward exception. And when someone like Bernie Sanders appeals to those passages in a straight-forward manner, it reinforces their assumption that these passages must not be straight-forward because someone who clearly has a problematic theology can deploy them so easily. In short, the reason Bernie Sanders never had a prayer at Liberty or with evangelicals more broadly speaking is because straight-forward appeals to Jesus' teachings that trade on the fact that you don't have to believe that Jesus is God to take his life and is teachings seriously are often undercut by the very premise of common ground. For evangelicals, if Jesus isn't God, then you can't understand his teachings in context. My argument, uncontroversial as it is, is that Evangelical Christians never took to Bernie Sanders because he cast a vision that they identified as "socialist." Then, all of his attempts to build bridges to people of faith were treated suspiciously as attempts to have the kingdom of God without the Lordship of Jesus Christ. He played into a familiar script that allowed Evangelicals to label what was wrong with his appeals to faith. Subsequently, once labelled, Evangelicals didn't have to take his challenge seriously because they already surmised the danger of his brand of liberalism. What is really sad in all of this is that, in my estimation, there is an element of truth in both the social gospel and in Bernie's concerns regarding income inequality. At the end of the day, Israel's prophets and Jesus actually said these things regarding wealth and governments that don't care for the people. It is as problematic to marginalize these scriptures as it is to proof text them. Legitimate concerns regarding humanist readings of the gospel should not prevent Evangelicals from coming back to these texts and wrestling with the responsibility they place on each of us. One of the most disturbing things, in my mind, about Evangelical Christianity in America today is its proximity to the Republican Party. For the sake of religious freedom and pro-life values, it aligns itself with a type of capitalism that turns a blind eye to life whenever it is expedient. Bernie Sanders may be a type of socialist, but it is a very mild type. What Bernie is trying to do is return America to vision that it had in response to industrialization, a vision that I would call a Commonwealth. What Bernie wants more than anything is for us to recognize that as a nation there are goods that we hold in common and that to neglect them is to neglect our very well-being. The gross privatization (and capitalization) of the prison system, the healthcare system, primary and secondary education, and the deregulation of our financial systems are all things that have threatened our ability to be a commonwealth. And Bernie's simple question to Evangelicals is, do the prophets say anything about this? does Jesus say something about this? did the early church speak out against this? Questions that remain largely unanswered on account of the fact the Evangelicals never took the one posing the questions seriously. I find it deeply ironic that Evangelical Christians will talk themselves blue worrying about so-called "death panels"–government run panels of people who make end of life decisions–and yet they have absolutely no fear that at the end of the day the people who will actually be making end of life decisions report to stockholders. Governments are corrupt, inept, and often make bureaucratic decisions based on limited resources but corporations are cold and calculating, ultimately serving the business interests of owners. Corporations are not friends to Christianity; they will turn their back on faith as soon as there is more money in it. Capitalism requires a certain amount of socialism if it is going to be a type of capitalism that submits to a Christian social vision. At the very least, Christians of all stripes ought to be willing to entertain the question of what a biblical vision of justice is and whether or not that has anything to say to our political and economic schemes. While I agree that the messenger, Bernie Sanders, was and is ultimately a flawed candidate, I am frustrated that Evangelical Christians tend to be unwilling to entertain the message. Indeed, in the 2016 election, they tended to prefer the very opposite of all of these things.